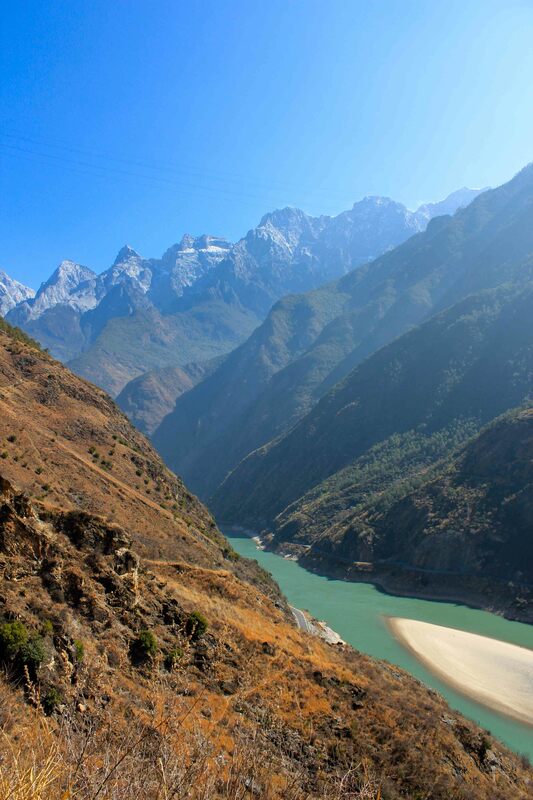 Tucked away in a distant area of Yunnan in southwest China, Tiger Leaping Gorge (虎跳峡) was once a relatively unknown area of beauty. In recent decades, however, the gorge has gone from a place of relative obscurity to a well trodden part of the back packer tourist trail. And it’s no wonder. 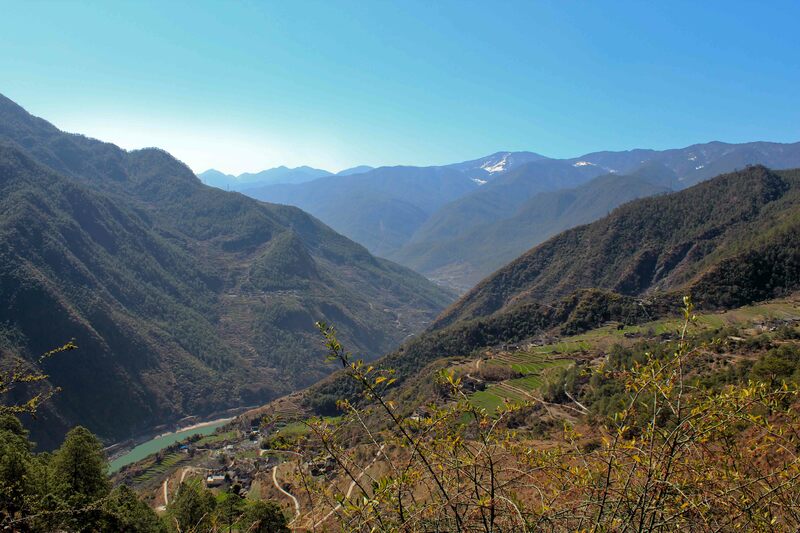 The gorge is awe inspiring with its ravishing views of permanently snow-capped mountains and humble villages inhabited by indigenous Naxi people. The view over our shoulders after an hour of walking. 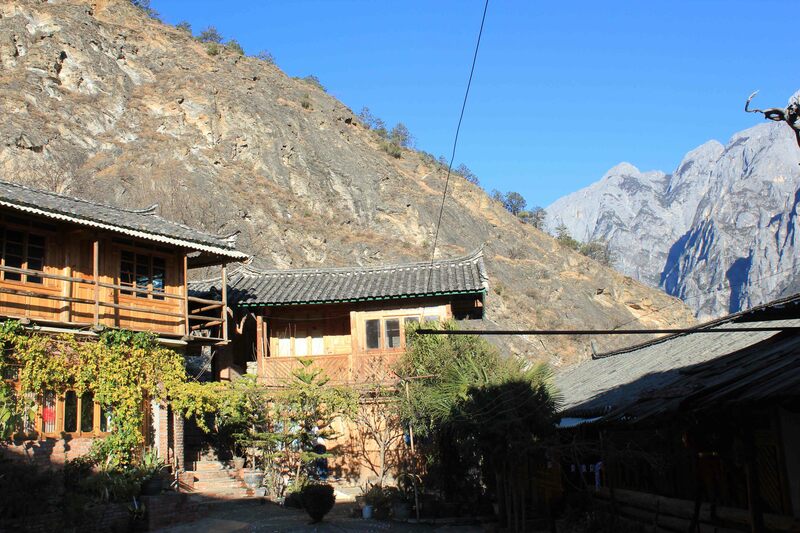 The right side of the canyon is dominated by the Yulong Snow Mountain (玉龙雪山), a beast of a mountain that demands respect. It rips up out of the earth at twisted angles with menacing crags and demented peaks that loom overhead, punctuating the crisp blue sky; its precipitous cliff faces dive deep into icy-blue river that carves through the canyon. 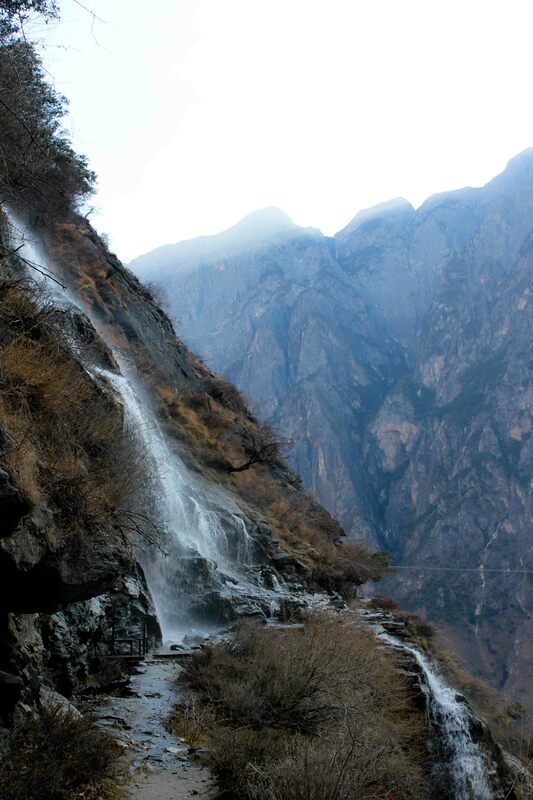 The spectacular gorge is formed by the flow of the Jinsha River (金沙江), one of the major sources of the Yangzi River, between the Yulong Snow Mountain and the Haba Snow Mountain (哈巴雪山). It’s conceivably one of the deepest gorges in the world. Now, high up above it, I’m about to jump. Across a waterfall. The waterfall comes from high above and carelessly pours itself over the path we’re following and off the edge of the cliff. The only way to navigate this and get back on the path is to hop across a stony outcrop of slippery stones that veer dangerously close to the edge of the cliff face. I glance about hopefully for a magical alternative route, but after seeing a goat herder and his goats nonchalantly cross it while on his mobile phone, I decide I can do it do. Bent almost double, fully allowing vertigo to rob me of any dignity, I make it across unscathed and continue on my journey. For the most part, the trek isn’t exceptionally dangerous or challenging. Every two hours or so, the ambling trail takes you past welcoming family-run guest houses – domestic oases offering tasty food, cool beverages and comfy beds along the fairly isolated trail. Cosy guesthouses serve up tasty food and refreshing beverages to help you on your way. 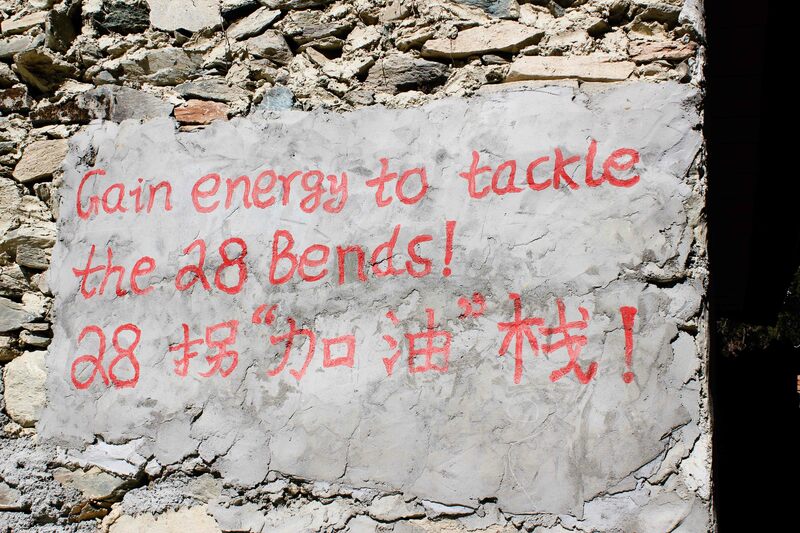 The hardest part of the trek is The 28 Bends (二十八拐到), which you reach after about 3 hours of hiking. Sounding like an extreme form of decompression sickness, The 28 Bends actually refers to the now notorious part of the trail that takes you up around 600m of seemingly endless twists and turns. Once you reach the top breathless, sweaty and half dead, you’re rewarded with a stunning panoramic view of the gorge and the knowledge that the hardest part of the trail is over. Reaching the end of the 28 Bends. It’s all down hill from here. The route through the gorge is made up of an upper and lower road. The newly built lower road snakes round the base of the gorge and is solely used to transport coach-loads of tourists down to the river’s edge. The upper road contains the dusty hiking trail that has existed for centuries and doesn’t just offer magnificent views of the area, but also a slice of history. 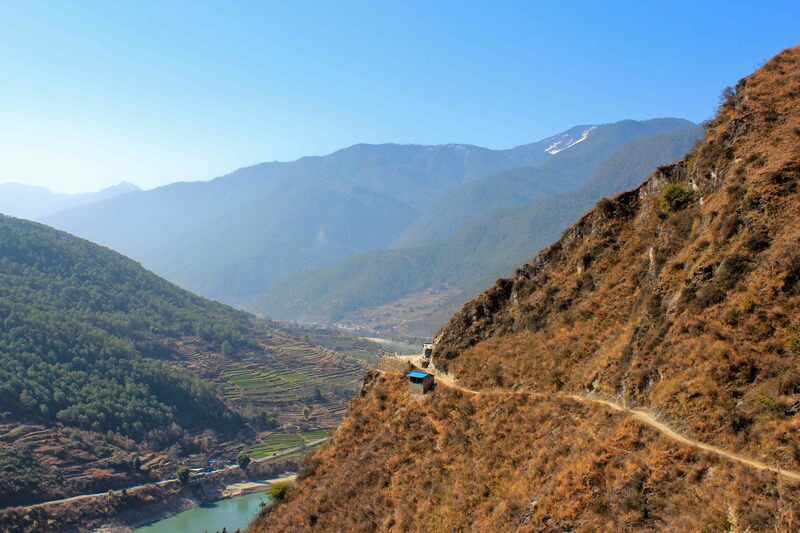 The upper road was once an offshoot of the ancient Tea Horse Road (茶马道), a network of paths and trails that wove for thousands of miles from depths of Yunnan and western Sichuan and ascended some 3000m to the frigid plateau of Tibet. During the Tang (618-907) Dynasty tea became an important part of the Tibetan diet. Tibetans took to mixing tea leaves with yak butter and salt to make a special brew called Yak Butter Tea, which became a staple of the Tibetan diet. The tea leaves, rich in proteins and nutrients, provided necessary roughage for the typical meat and dairy heavy Tibetan diet. 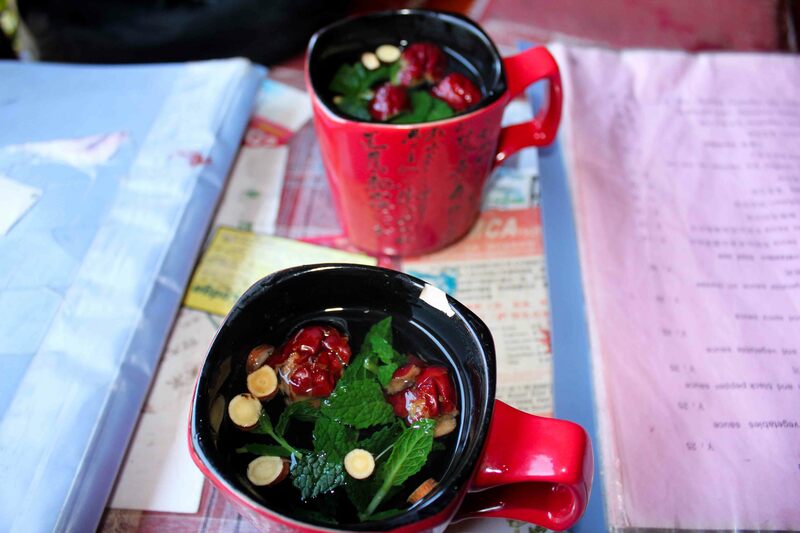 The tea that was favoured for this concoction was Pu’er tea, which sprouted on the mountains of Pu’er prefecture and in other areas of Xishuang Banna. 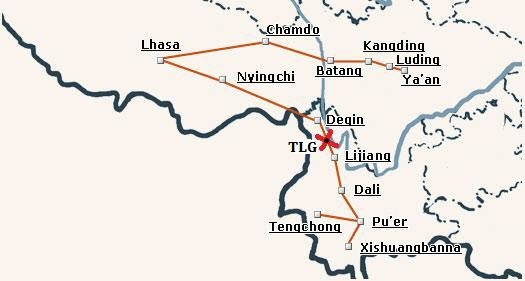 A map showing the tea-horse route that ran between Xishuangbanna, Sichuan and Tibet. 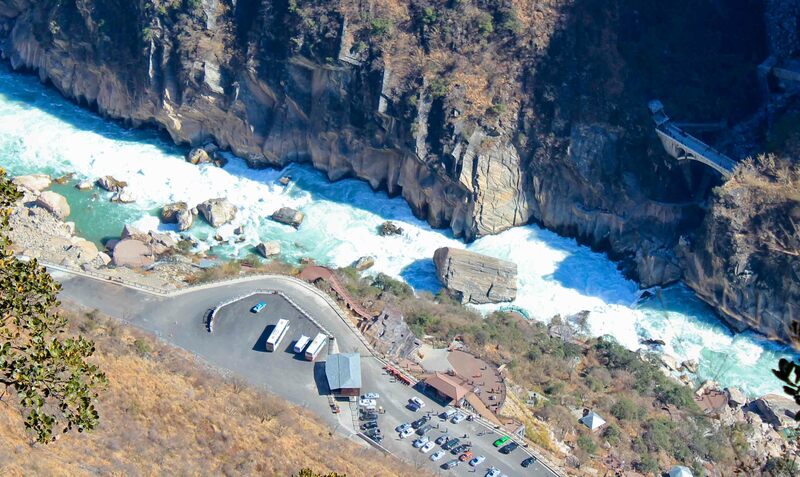 (TLG = Tiger Leaping Gorge). So it was that during the early part of the Tang Dynasty, China began trading Pu’er tea with Tibet, which it had in abundance, for horses, which it did not. This trade route remained active until well into the 20th Century. However, trading reached a peak during the Ming (1368-1644) Dynasty with China acquiring 25,000 horses annually in exchange for over 3 million lbs of tea. The tea was not only carried by yaks and in mule drawn caravans, but also by human porters who would undertake this strenuous journey on foot. 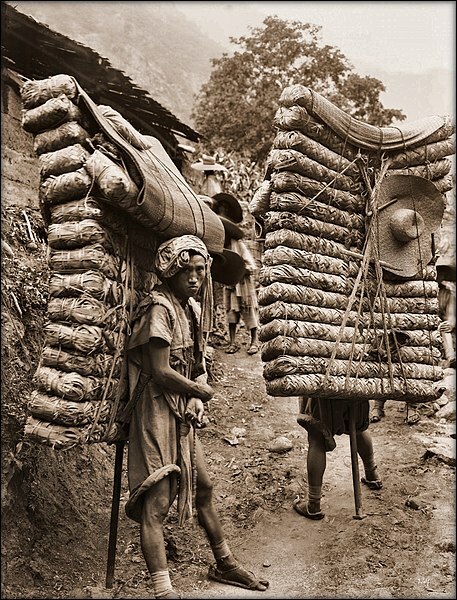 Tea porters, Sichuan, 1908. (Ernest H. Wilson). 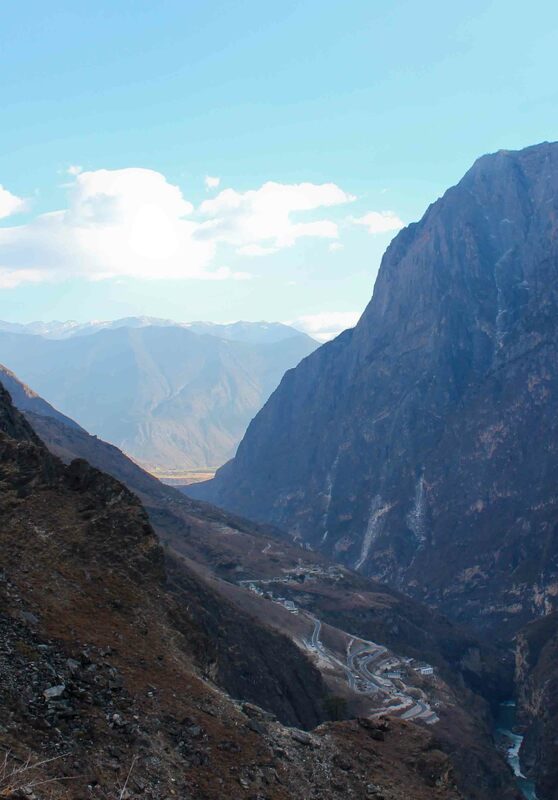 And today this narrow trading path, which once felt the footsteps of thousands of tea-laden porters and mules each year, still clings precariously to the upper cliffs of the gorge, 2670m above the icy, rolling waters of the Jinsha river. 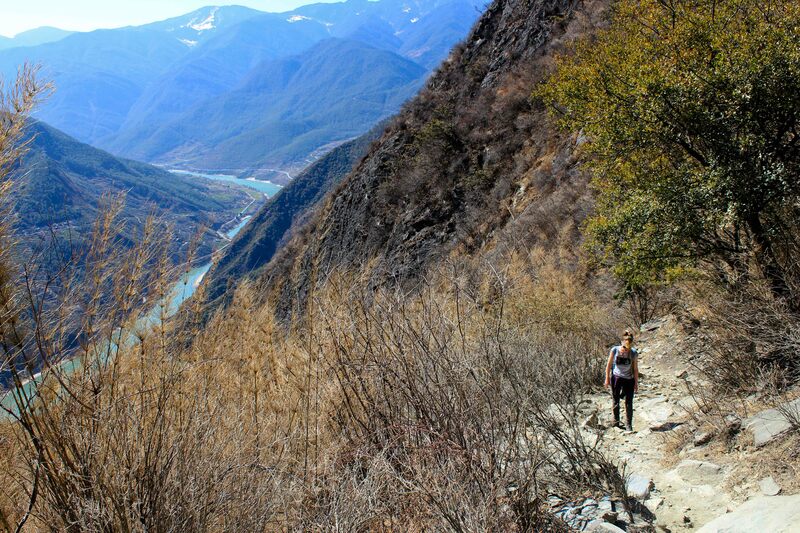 The dusty and narrow upper path of Tiger Leaping Gorge. For the early part of the trek, the river lies like a turquoise ribbon at the bottom of the gorge as it glides along peacefully; it’s hard to hear the gentle roar of the river over the playful rush of wind in your ear and the tinkering of distant mule-bells. However, about 4 hours into the trek this suddenly changes. The gorge narrows, and the river starts roaring and stampeding through the chasm. The river starts roaring past the lower road. For the final third of the hike, the path scurries past and through waterfalls, and then begins to descend. Our path was blocked by this little waterfall – the only way through was to just walk through it and hope we didn’t slip and fall a few hundred feet (!). It eventually abandons you in an open plain set at a jaunty angle with no clearly discernible path; however, the lower road and the guesthouses that line it are clearly visible. 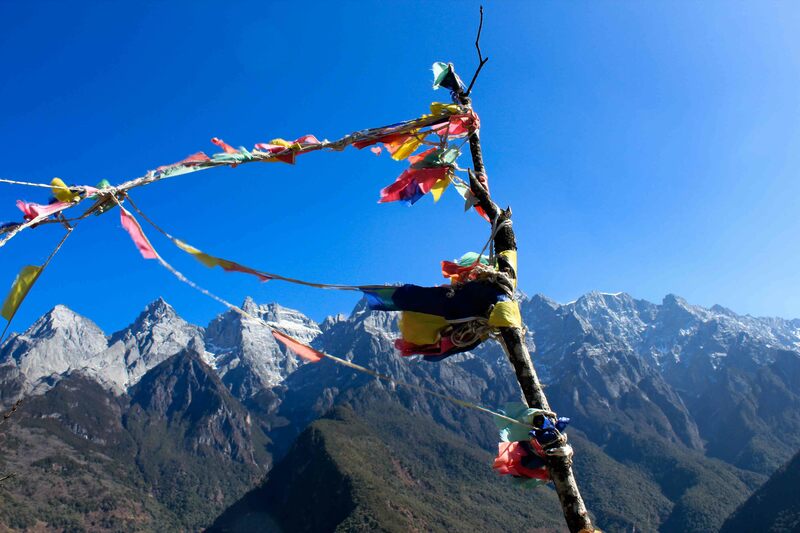 It is possible to pick up the trail again and head off on a 4-day trek through the Haba Snow Mountain range and into Tibetan provinces, but for this you need an experienced guide. We were content with just heading on to a guesthouse for a cup of Pu’er tea and a rest. After all the hiking, scenery gawking, history pondering and mountain worshipping, we were pretty tired. The winding lower road and the end of the trail starts to appear. * This trek took place towards the end of January 2012. 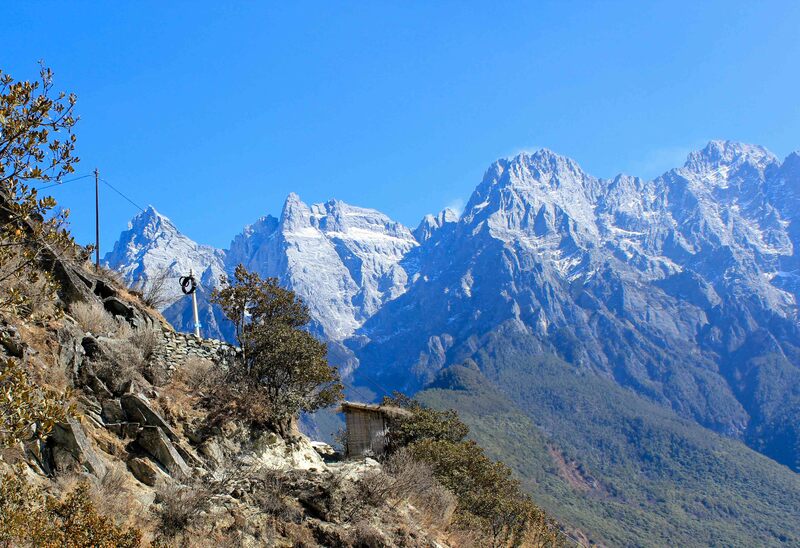 We did the trek over 2 days, staying at Jane’s Tibetan Guesthouse and The Halfway House enroute. We walked about 6 hours on the first day and 2 on the last day.